The adjustable chin strap with a buckle will keep the hat firmly on top of your head. It will also allow you to change the style by putting the earmuffs up or down. 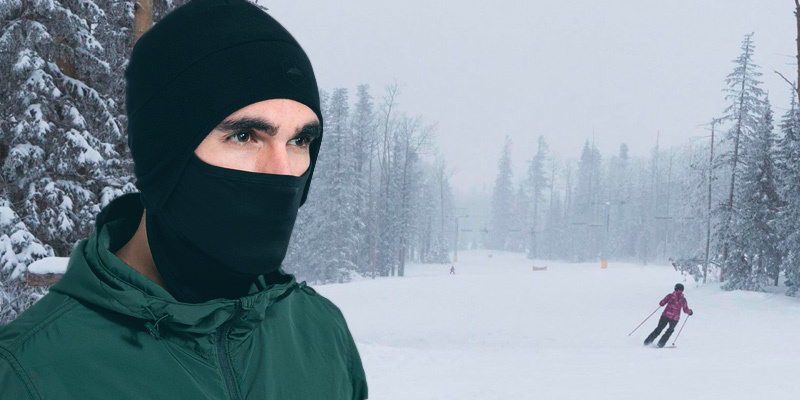 A removable facemask makes the model suitable for winter sports. The facemask isn't particularly warm. This winter trooper hat from Mysuntown is about as flexible and versatile as a hat can get. The attractive dark faux fur lends it a classic look, making the model one of the very few hats on the market today that is equally visually appealing, warm, and comfortable to wear. Equipped with a stiff enlarged visor, this winter hat will keep the sun and snow out of your eyes. 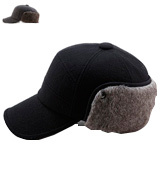 You can snap the earflaps and use this baseball cap to keep your ears and your neck nice and warm. The buttons lose their grip over time. If you love baseball caps, you cannot go wrong with this SIGGI Winter Wool Cap. It gives you all of the benefits of a baseball cap but without any of its downsides. Unlike your average winter hat, it will allow you to enjoy your favorite summer activities in the winter. Made of 100% stretchable acrylic fabric, the model equally fits teenagers and adults, regardless of the size of your noggin. The rib-knit structure of the fabric makes the hat particularly warm. 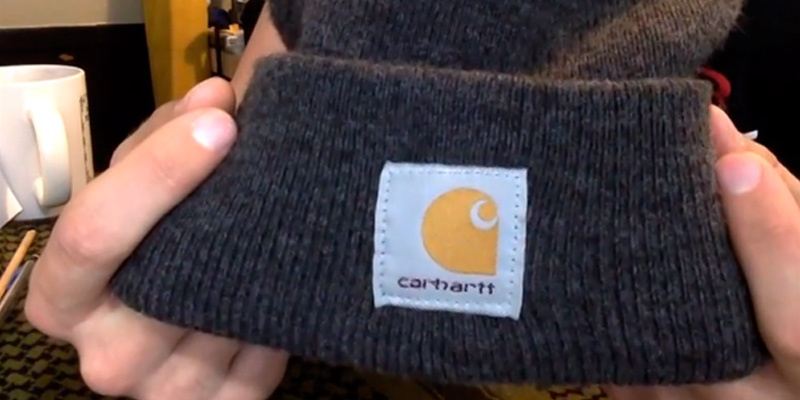 The Carhartt logo will give you extra street cred. The white patch is easily soiled. 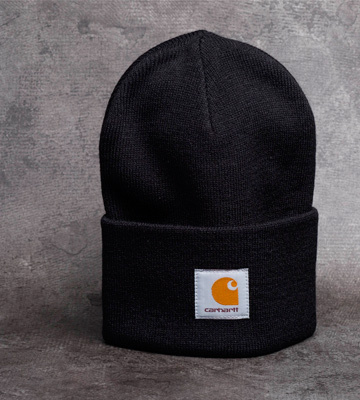 Carhartt Men's Acrylic Watch Hat is a classic beanie hat. It comes in a variety of different colors, so you'll be able to match your style. It suits most outfits. 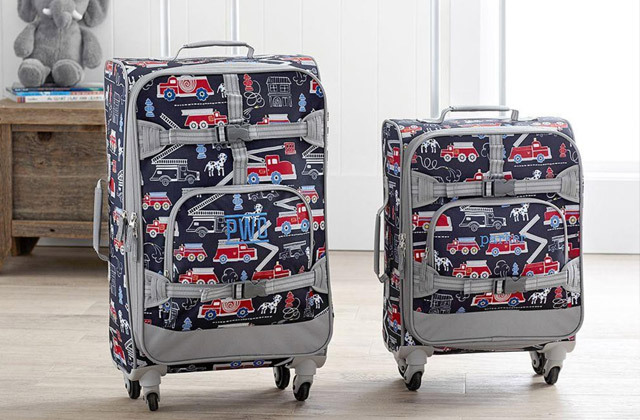 The model's machine washable, so you'll easily be able to keep it in a good shape. In addition to a great beanie, the set also includes a loop scarf. The dual-layer design incorporates a particularly thick and chunky acrylic knit structure that keeps you snug and warm. Aside from acrylic, the beanie features a soft fleece inner lining with great heat retention properties. Some customers find the actual sizes smaller than the ones advertised. This 2-piece set from Loritta makes for a great gift. The beanie and the scarf work equally great separately or together. Plus, its unisex style makes both of these accessories suitable for men and women. If you like your jackets collarless, this is the model to go for. 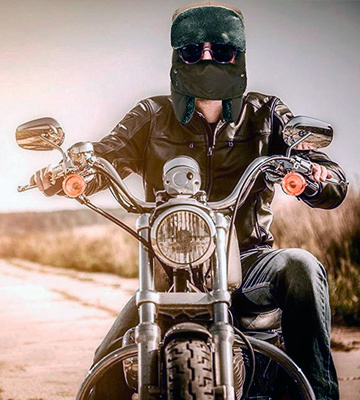 You can pull down the facemask and turn the balaclava back into a skull cap or a beanie. Plus, you can use the mask as a buff (neck warmer) or as an additional beanie lining for those super cold winter days. 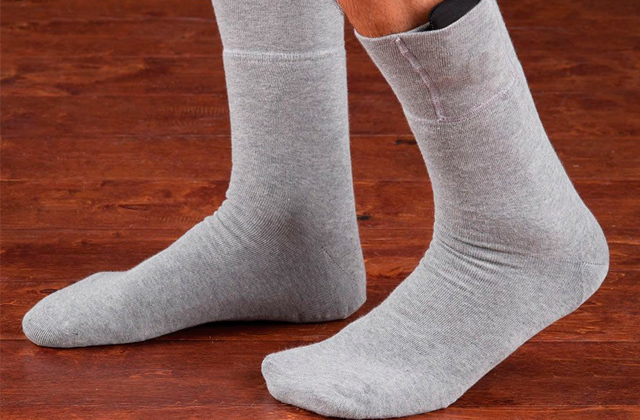 Spandex and polyester make for a stretchy and breathable fabric. This model will easily prove to be the best bang for your buck if you're the type of person who spends his winter days chasing powder, conquering black diamond pistes, or backcountry skiing. That said, it is just as good of a hat for bikers, aspiring athletes, and fitness enthusiasts. Want to look cool and imposing yet feel snug and warm at the same time? You'll be hard-pressed to find a better deal than this Mysuntown unisex winter trooper hat. Now, we probably don't have to explain the "cool" part. Just look at it, this stylish thing is the epitome of coolness. As for the snugness and warmth, there are 2 factors that contribute to it. First, there are the materials. 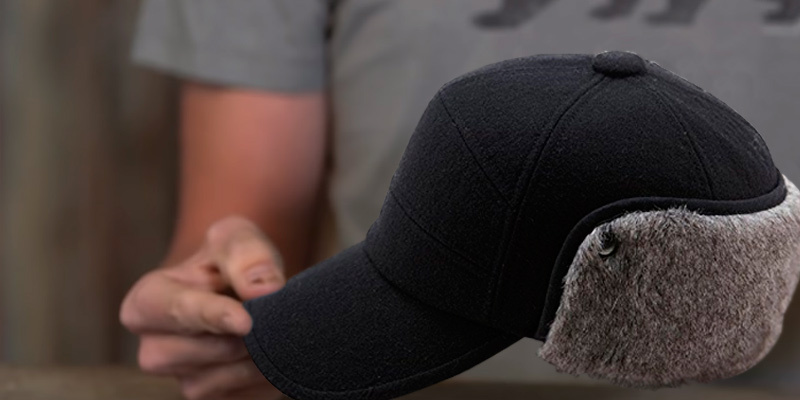 Equipped with 100% premium insulating polyester outer shell and a luxurious inner faux fur layer, this thing maintains body temperature as well as the next hat. It is completely windproof, so you won't have to worry about that either. 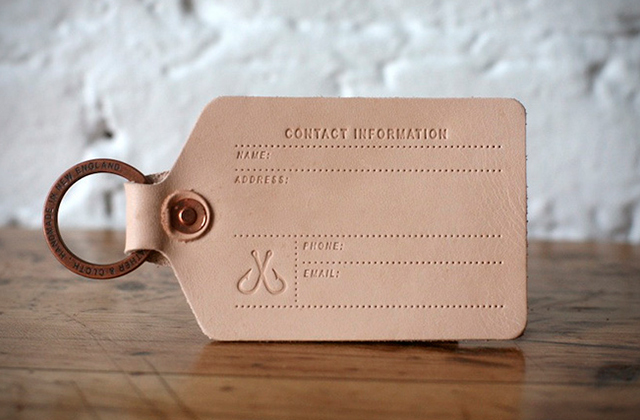 Material aside, there's also the design of the whole thing. 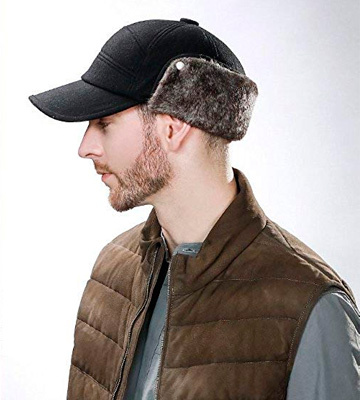 In addition to the Russian-style hat, you get an adjustable chin strap that keeps your neck and your ears warm. Aside from the practical side of the things, it will also allow you to change the style by putting the earmuffs up or down. On top of the chin strap, the model includes a removable face mask. 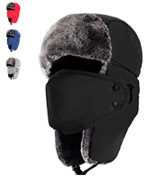 As you'd imagine, a mask like that makes this men's winter hat additionally suitable for winter sports and other outdoor activities like hunting or hiking. Long story short, this winter trooper hat from Mysuntown is about as flexible and versatile as a hat can get. The attractive dark faux fur lends it a classic look, making the model one of the very few hats on the market today that is equally visually appealing, warm, and comfortable to wear. Winter hats may be necessary but they're seldom as convenient baseball caps. But who says you can't combine the two into one? 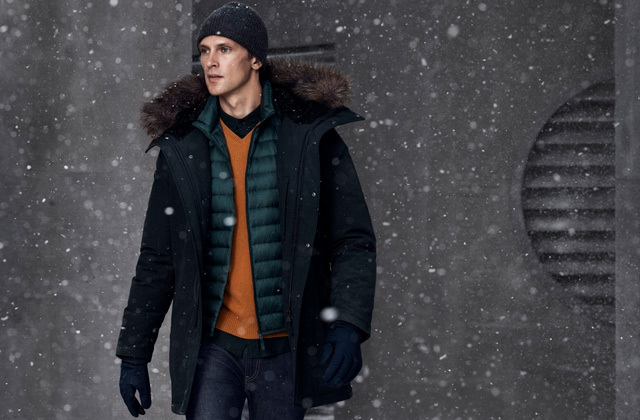 As far as we can tell, this model from SIGGI does it well and effortlessly enough to make it an attractive winter option for baseball cap fans. Unlike just about any other type of winter hat, this thing right here won't just keep your head warm. Equipped with a stiff enlarged visor, it will also keep the sun and the snow out of your eyes, so you'll be able to enjoy your favorite summer activities as well as winter sports and seasonal outdoor endeavors. Generally speaking, the biggest weak point of baseball caps is that they do not protect your ears or your neck, just the head. SIGGI solved this design flaw with ear flaps and 2 snap buttons. When the temperature drops down to an uncomfortably cold degree, just snap those buttons and you'll be able to keep your neck and your ears nice and warm. The buttons do tend to lose their grip over time but nothing that could cause a major inconvenience. Finally, what we particularly like about this men's winter hat is the combination of wool and polyester used in the outer design. 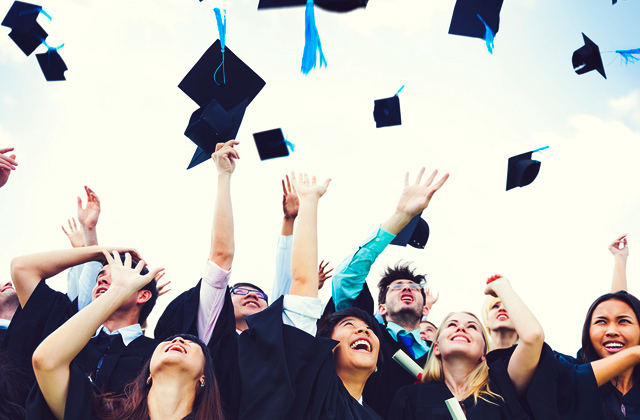 It isn't easily soiled so, with little effort, you'll be able to maintain the hat and keep it in a great condition for years to come. Bottom line, if you love baseball caps, you cannot go wrong with this SIGGI Winter Wool Cap. It gives you all of the benefits of a baseball cap but without any of its downsides. Unlike your average winter hat, it will allow you to enjoy your favorite summer activities in the winter. There are so many different hats out there with all kinds of crazy designs and arrangements. But let's be honest - nothing beats a classic beanie. It suits anybody. It works with anything, regardless of your outfit or the kind of look you're going for. 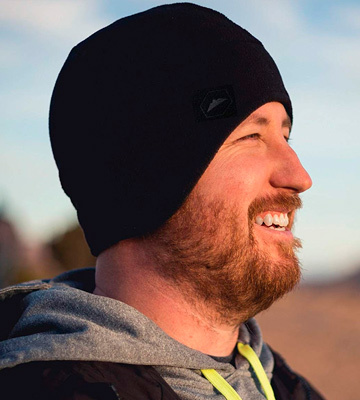 Sure, you might experiment with a baseball cap or a trooper hat, but there's a good chance that you will always reach for your trusty beanie the moment the wind gets blustery and the temperature drops to an uncomfortable level. Of course, there's not much to cover here. Made of 100% stretchable acrylic fabric, the model equally fits teenagers and adults, regardless of the size of your noggin. On top of that, the rib-knit structure of the fabric makes the hat warm and easy to maintain. 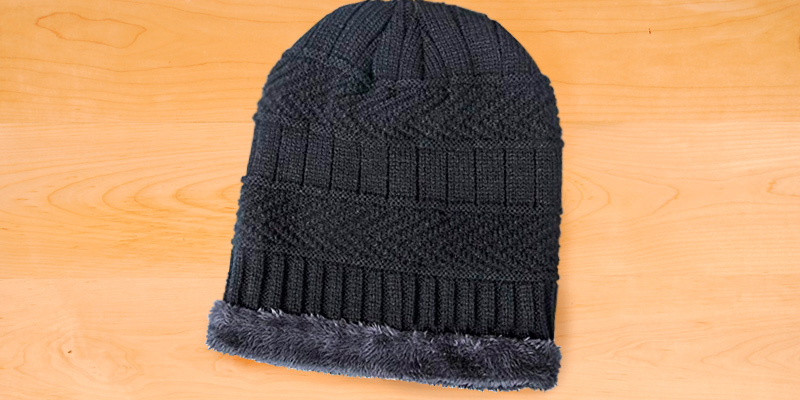 The company's recognizable logo is sewn on the front of the beanie. It will give you a little extra street cred and spice up the otherwise classic look of the hat. But if that's not something that appeals to you, you can always fold it up and hide the patch. Actually, we would recommend occasionally doing that regardless of how you feel about the Carhartt company and their logo as the patch is kind of easily soiled. 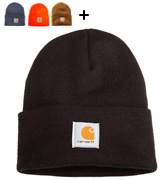 All in all, Carhartt Men's Acrylic Watch Hat is one of the best winter hats for men who want a classic beanie hat. It comes in a variety of different colors, so you'll be able to match your style. The model's machine washable, so you'll easily be able to keep it in a good shape. You can never really go wrong with a beanie. Having said that, it's not like it doesn't have its flaws. Sure, it keeps your head and ears warm, but what about your neck? Well, that is where this 2-piece set from Loritta comes in. In addition to a great beanie, it also gives you a loop scarf. With both of these accessories, you won't need any other clothing item to keep your head and your neck warm. But it's not like it's just about the quantity here. Quite the opposite, actually. Sure, the loop scarf is nice, but the beanie is where it's at. 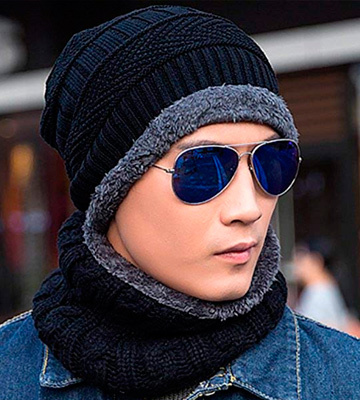 With its dual-layer design, this men's winter hat incorporates a particularly thick and chunky acrylic knit structure that keeps you snug and warm. 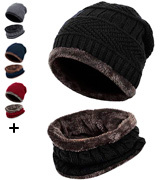 Aside from acrylic, the beanie features a soft fleece inner lining. It has far better heat retention, so you'll be able to enjoy unmatched warmth. Finally, what makes this beanie better than most of its peers is the delicate sewing thread. 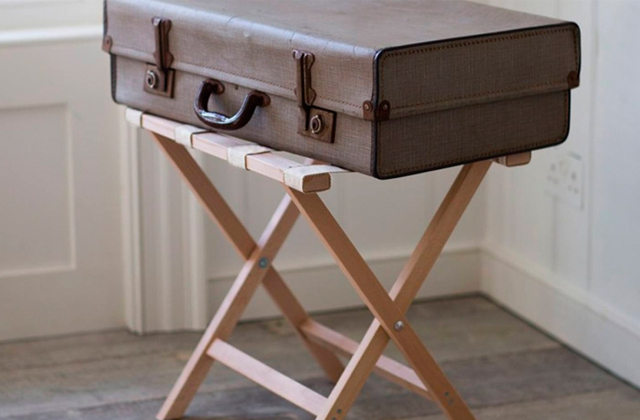 A little extra durability never hurt anybody, wouldn't you agree? A somewhat underrated part of this 2-piece set is how easy the acrylic fabric makes the model in terms of maintenance. Stick to cold water and you'll be able to effectively wash it in any washing machine. 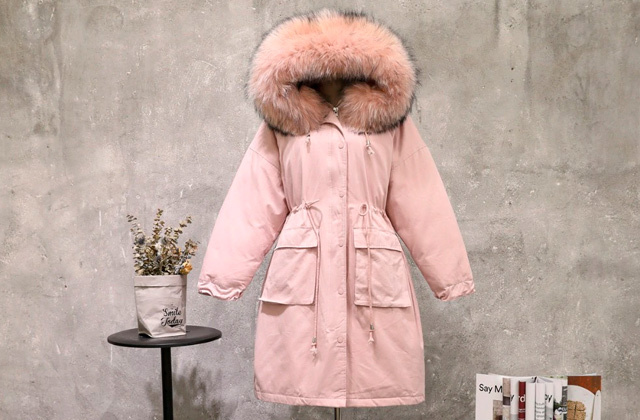 Acrylic doesn't stretch and the faux fur lining doesn't lose its fashionable appearance. To sum it up, this 2-piece set from Loritta makes for a great gift. The beanie and the scarf work equally great separately or together. Plus, its unisex style makes both of these accessories suitable for men and women. If you like your jackets collarless, this is the model to go for. Winter is no excuse to stay indoors and get fat. On the contrary, winter sports is where it's at. But, to fully enjoy those winter sports, you'll need proper winter gear. And that is where this Tough Headwear Helmet Liner comes in. Having said that, we would be doing this model a disservice calling it a helmet liner. Well, it is a helmet liner. But it is also a beanie with a cutout on the back of the hat for your ponytail, a skull cap with ear covers, and a flexible balaclava. 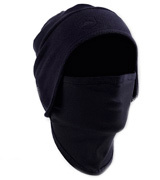 The flexible part means that you can pull down the facemask and turn the balaclava back into a skull cap or a beanie. 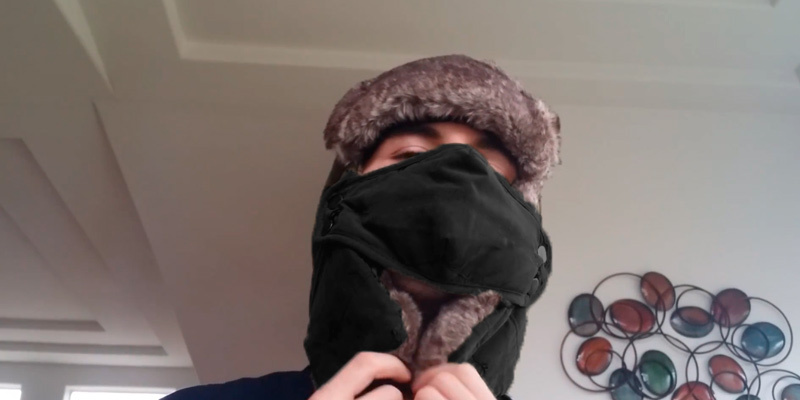 Plus, you can use the mask as a buff (neck warmer) or as an additional beanie lining for those super cold winter days. Unfortunately, it isn't detachable, so you won't be able to use it as a buff without the hat. Aside from its flexibility, the biggest part of the model's sell is its combination of polyester and spandex. These two materials make for a fabric that is equally stretchy and breathable. It wicks away your sweat while the brushed lining ensures thermal retention, so you stay dry and warm no matter what. All things considered, this model will easily prove to be the best bang for your buck if you're the kind of person who spends his winter days chasing powder, conquering black diamond pistes, or backcountry skiing. That said, it is just as good of a hat for runners, bikers, and all kinds of different people who lead an active lifestyle. What Is a Mens Winter Hat? 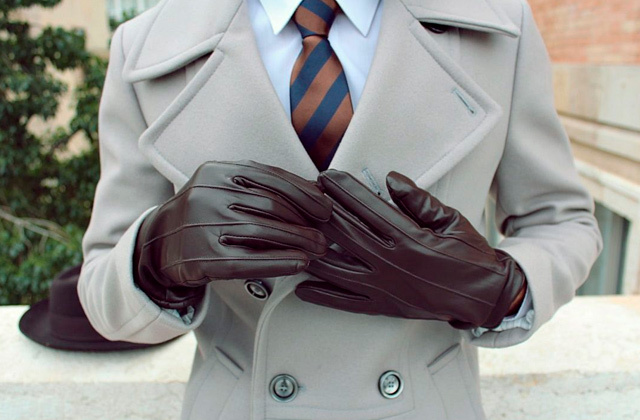 Come winter time, a hat isn't just a fashion statement and an accessory that you wear whenever you feel like it. No, it is an important (arguably the most important) part of your outfit. 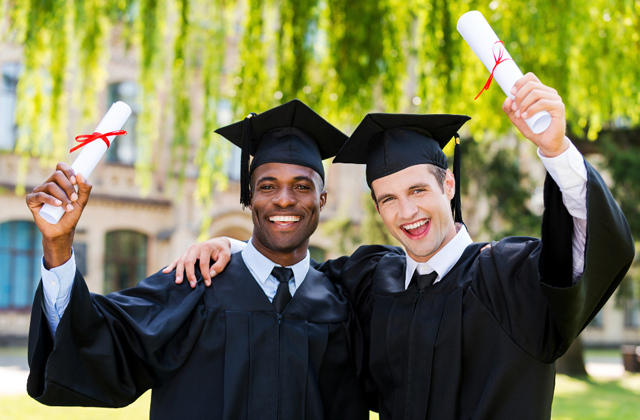 Without a hat, you're running a risk of catching all kinds of serious symptoms and diseases. That said, you still want to look good and, don't worry, there are plenty of different hats out there that will match your style and even allow you to accentuate your features. You have your beanie caps that are as versatile as a hat can get. There are trapper hats that, while not as versatile, excel at keeping the entirety of your head nice and warm. Not a fan of winter hats in general? No problem, just grab a baseball cap with earflaps and you're good to go. At the end of the day, there isn't much of a science behind it. You pick the hat that speaks to you, consider the materials that it is made of, and check all of the extra features that it may or may not incorporate, and that's about all there is to it. Already have a great hat or two and don't really feel like buying a new one? That's fine, but you might want to check out our reviews of winter boots and hiking boots for men, they go really well with a winter hat.